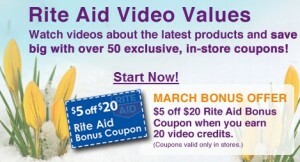 There are new coupons at Rite Aid Ad Perks. They can be stacked with manufacturer coupons!! Also you get a $5 off a $20 purchase coupon. (my favorite!) Watch the commercials and then you have access to them. Takes about 10 minutes.